Thanks to its DoubleJoint hinge system and integrated ski clearance, the Yakima FatCat 4 w/Locks can securely stow up to four pairs of fat powder skis or two snowboards. The included SKS Locks keep your boards safe from would-be villains, and the tool-free installation is quick and easy. 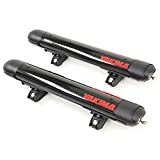 Yakima Horizontal MightyMounts are simple attachments that convert popular factory racks into a multi-sport system instead of having to buy a separate basic Yakima rack. They are a quick and easy, economical way to attach Yakima bike mounts, baskets, and water accessories to your factory rack. Make sure you know which MightyMounts you need. Haul up to 6 pairs of skis or 4 snowboards to your favorite slope with the Yakima Powderhound 6 ski rack. It includes universal hardware to fit round, square, factory and aerodynamic crossbars. 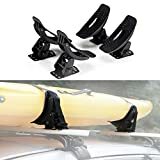 Ski Car Rackhold up to 6 Pair Ski Rack or Snowboard car rack hold up to 4 Snowboard Rack, is also ideal for carrying fishing rods, paddles, ski poles and water skis. Perfect for family weekends or ditching work on a powder day, the FreshTrack is made for loading up and finding first tracks. Wide enough for a couple of boards or pairs of skis, simple to mount on virtually any roof rack - no tools needed - and super easy to use, it's great for fresh powder and blue groomers. One-button access allows gloves-on operation, and the built-in SKS locks secure your gear.